Attending business school in the U.S. promises to yield a lot more than a degree for South Korea native Yeonwoo Kim, a third-year management student at Virginia Tech’s Pamplin College of Business. 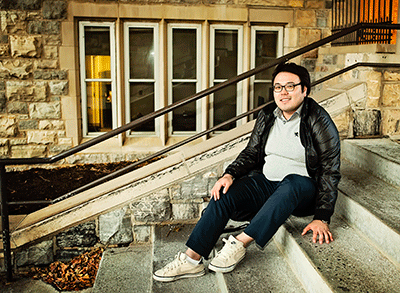 He expects his education in Blacksburg to open doors to job prospects back home because the top 100 American business schools have almost an Ivy League status in his country. Major companies like Samsung, Hyundai and the CJ Group prefer to hire graduates of U.S. business schools, who can speak English fluently and understand American culture. Kim is just one of a growing number of international students enrolling in undergraduate and graduate programs at Virginia business schools. For example, 29 percent of students who enrolled this fall in the Darden School of Business Administration’s MBA program hold passports from 37 countries. Foreign nationals make up 44 percent of the current class of 92 MBA students at the College of William and Mary’s Mason School of Business. The George Mason University School of Management has seen a surge in its number of students from China, especially in the master of accounting program. International enrollment at the University of Richmond’s Robins School of Business is currently at about 10 percent, but each semester classes are further diversified with the addition of foreign exchange students from 25 partner schools. At Virginia Tech, the number of international students in undergraduate programs has doubled since the mid-2000s. Nationally, international students made up 14.5 percent of total U.S. business school enrollment in 2012-13, according to the Association to Advance Collegiate Schools of Business. On first glance, it’s easy to presume that international students themselves are primary beneficiaries of this trend. After all, despite the difficulty in obtaining H-1B visas, international students graduating from U.S. business schools have a greater opportunity of being recruited by an American company or an international conglomerate. Or, as most do, international students can take their U.S. training back home and have a positive effect on their local economy, starting a company or working for an existing firm. The true impact of the international student trend, however, is much more far-reaching, business school officials say. “It’s a multiplier effect,” says Robert Bruner, dean of the Darden School. He notes that international diversity benefits other students, improves the overall quality of business school education and helps stimulate the economy. For example, the 2,000-plus international students enrolled at Virginia Tech in the 2011-12 academic year contributed $43 million to the regional economy, according to Brian Bolton, director of the Cranwell International Center at Virginia Tech. The economic impact includes out-of-state tuition payments, dining, travel, communications and shopping. The biggest beneficiaries of international diversity likely are American business students who rub elbows with classmates from foreign lands. Bruner notes that the rise in global trade and international business practices requires educators to prepare students for a cross-border reality. One of the best ways to do that, he says, is through a more diverse student enrollment. The richest exchange of cultural perspective comes when students are placed in small discussion groups or project teams. At Virginia Tech, any group work always includes teams made up of at least one international student. “This is where they fully express their differences in how they approach the topic and view things, and so the students really get into the nitty gritty and learn from each other in a better context,” says Reed Kennedy, director of Pamplin’s international programs. Those discussions often translate into strong friendships and “a good starting foundation of a network of global contacts that they’ll keep and maintain for the rest of their lives,” says Larry Pulley, dean of the Mason School of Business at the College of William and Mary. In fact, these Virginia experiences are supported by a Duke University study of 5,676 alumni published in the Journal of International Students in June. The authors found that graduates who interacted with international students during their college careers were more likely to develop stronger cognitive and social skills, such as learning a foreign language, relating well to others of different cultures, nationalities and religious beliefs and the ability to independently acquire new knowledge and formulate creative ideas. Those characteristics, typical of what Bagranoff likes to refer to as “worldly” students, are extremely attractive to companies that recruit from Virginia business schools, which range from multinational corporations with operations in the U.S. and other countries to small Virginia businesses that rely on imports and exports for sales growth. International students at U.S. business schools and American students who share classes with them can provide employers with a greater capacity to do business “glocally,” which means thinking globally but selling locally, says Jack Oakes, assistant dean of career development at the Darden School. The one controversy around the increase in business school diversity is the charge that international students are potentially taking up seats that would otherwise go to U.S. students. Many business school officials are quick to counter this idea by pointing to the fact that the number of U.S. students sitting for the Graduate Management Admissions Test (GMAT) has plunged 15 percent since 2002, even while the number of Asians taking the test has jumped 11 percent in just the last five years.